(Nanowerk News) Ethers – simple organic molecules in which an oxygen atom bridges two carbon atoms – are the chemical building blocks of commonplace products including many solvents, propellants, cosmetics and pharmaceuticals. Link them together in large molecular rings and they become scientific royalty—crown ether molecules, whose development led in large part to the 1987 Nobel Prize in chemistry. These crown-shaped rings are important as the initial prototype in host–guest chemistry, a field in which “guest” ions and molecules can be captured within the cavity of a “host” molecule. This capability allows chemists to organize a collection of separately weak bonding interactions, such as the electrostatic bond between an ether oxygen atom and a metal ion, to achieve strong, selective binding. This useful property, called “molecular recognition,” is employed for separations, sensing and catalysis. The results, published in Nature Communications ("Crown ethers in graphene"), may herald a new reign for crown ethers in diverse applications. Their strong, specific electrostatic binding may advance sensors, chemical separations, nuclear-waste cleanup, extraction of metals from ores, purification and recycling of rare-earth elements, water purification, biotechnology, energy production in durable lithium-ion batteries, catalysis, medicine and data storage. The size and shape of the cavity formed within a crown ether molecule confers selectivity for complementary ions and small molecules that fit it, like a lock and key. Crown ethers come in different sizes, so they can accommodate ions of different diameters. In a crown ether, the electric dipole moments of the C–O–C ether groups when organized around a captured guest metal ion provide a large electrostatic potential for binding the ion in the ring cavity. The host can then transport the guest to places it normally could not go, such as through cell membranes. The fact that only the guest ion can be so transported makes crown ethers especially useful in science and technology. ORNL researchers used a chemical approach to produce graphene. Cristian Contescu and Nidia Gallego started with graphite, oxidized it to form graphene oxide and then reduced that to form graphene. Because reduction never gets rid of all the oxygen, the oxygen that remains must be very strongly bonded to carbon atoms. 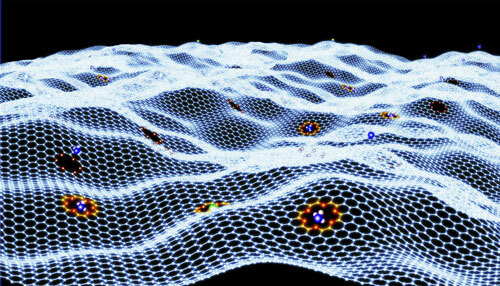 When oxygens and carbons alternate around the rim of a hole in the graphene, crown ethers form in the rigid material.